There are a number of reasons to hot process soap. Hopefully this “How to Hot Process Soap Video Tutorial” will answer a lot of your questions. Some people hot process every batch of soap because they like the idea of being able to use it right away. Hot processing it increases the speed at which the lye converts the oil into soap. In other words, instead of having to wait 4-6 weeks for your soap to cure, you can use it almost as soon as you get it out of the crackpot. Sounds great! Another reason people will hot processing soap is because they like the texture. When you pour cold processed soap, you are pouring the soap into your mold when it is still a liquid (though it will vary in thickness depending on how much it has set up). When you hot process soap, you are ending up with a mashed potato-like consistency that needs to be spooned into a mold. It is more chunky on top after you cut it and it looks a bit different on the inside too. This does not change the hardness or its quality (though some will debate you on that), but it does change the texture. I know a number of men, especially, who said they liked the look better. Maybe because it was more chunky, looked more masculine. I don’t know…it’s soap. A third reason people will hot process soap is when something goes wrong. Basically, never throw out a botched batch of soap. It can almost always be fixed. 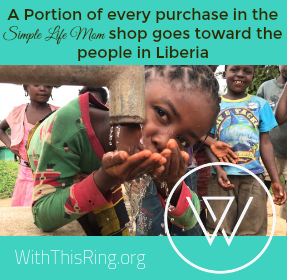 It may not be exactly as you envisioned in the end, but you will definitely end up with a soap that is usable. So, no waste! Which is especially great to know if you are nervous about making soap or if you have put in a lot of expensive ingredients. If you end up with a chalky soap that is crumbling in your hands, it could have not been incubated well enough in the first few hours, or it could be lye heavy. Either way, you can hot process it (like I did in the video) and make it come out wonderfully. If you suspect that it is lye heavy, just add a bit of water to your batch. A 7lb batch usually needs at least 1 cup of water added during hot processing. It’s much harder to get a pretty swirl when adding color as well. Make your soap as usual, by bringing it to trace. When you would normally pour into your mold, pour it into a crockpot with a very low setting. If you have already let the bars set, that’s fine, just break them into small chunks and throw them into the crockpot. Add a touch of water ONLY if your soap is lye heavy. Otherwise, watch it as it starts to warm. It will become bubbly around the outside edges. You don’t have to stand over it. You can walk away, but check back every 10-15 minutes. When it starts to bubble, give it a stir. You want the entire batch to get the bubbly translucent look to it. When the entire batch is translucent you are probably done. This should take at least 2-3 hours. Line your mold and scoop it in. Pat it with a spoon to get out any air bubbles. Texture the top as desired. When it is cool and hard, remove and cut. It will continue to harden as it ages, but it can be used immediately. **There’s a message button at the bottom right corner of my blog if you need to ask questions. I’d love to help. Have you tried hot or cold processing soap? Making soap is on my list of to do’s. Thanks for the great information. When I am ready to give it a try I will know right where to come to get good information. I’ve never made soap before. I always thought it was difficult to do. Your version looks simple and easy to do. I would like to make my own soap someday! There is a stand at my local farmers market that sells handmade soap and it is the best! They have some really great scents. Thanks for sharing with Hump Day Happenings. Thanks for stopping by. Soap is one of those things that you just have to dive in and try…after doing some reading up of course 🙂 I don’t know anyone who felt ready the first time. I enjoy making homemade soap, so I appreciate you sharing the way you do it. Thanks so much. Pinning this now. I make our soap using the cold press method, but have not tried the hot press method. Something new on my to try list – thank you! And I see so many wonderful glimpses here of things I’d like to read more about, so I will definitely be back soon for a visit. Stopping by from Proverbs 31 link up today. Cold process is my favorite, but there have just been those times where hot process was necessary. It still gives you a great soap, just a different texture. Glad you stopped by. Hello! I just made two batches of HP soap with the same recipe. Batch 1 just would not come to trace and ended up an oily mess with granules or foamy stuff on the surface of the mess. The fats (coconut oil, olive oil and palm oil) were warm but the lye mixture was left outdoors for a bit to cool down. This is FL so it is far from cold. Barely jeans weather. Batch 2 same exact recipe came to trace, cooked up just fine and is molded. Ack! So mad about maybe wasting expensive ingredients. Any advise? First, were these all cold processed or hot? Both lye and your fats should be around 100 degrees. The lye can be a bit cooler. I’m not sure if you measured, if they were too hot…. Sometimes there is separation because you did not stir it enough. A stick blender is the best thing to use, though hand mixers are fine too. You can do it by hand, but it tends to lose too much temp. that way. Another cause could be if you used a fragrance oil. Some fragrance oils tend to cause separation before you even get it out of the pot. NO matter the cause, I’m sure you want a solution. If this happened as you were cold processing (pouring after bringing to trace), then I would put that batch into a crock pot and cook on low. When it starts to “cook” use a hand mixer on it and make sure it is mixed super duper well! Continue to cook on very low until it starts to look like mashed potatoes. When it is all the same consistency scoop it into a mold and press into shape. So…. I made your butter soap using the recipe provided here on your site…. Well that was not exactly the full recipe I used… I decided that it was worth me doing 1.5 times that amount that your recipe called for. Writing everything down carefully from your recipe, I headed down to my little soap making spot in my basement. 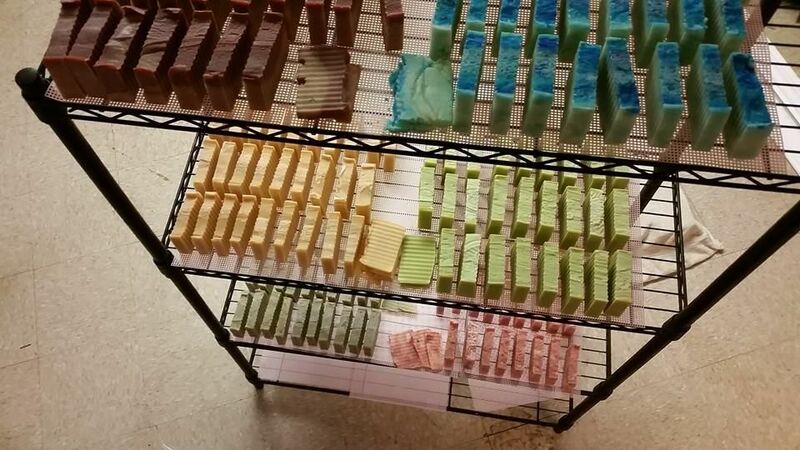 I used mostly white palm oil, but had some red on hand and decided to use some to color the batch, or at this point see what it would do… I made the soap, poured it into the mold, covered it to allow it to do its thing for at least a day…. Looking over the recipe I copied down, I realized I didn’t cut back my lye by 25% after I wanted to produce a 6 pound loaf. So I put enough lye into the batch to produce a 8 pound loaf, while the rest of the recipe was correct for the 6 pound loaf I wanted to make in the first place. No problem. You can definitely save it. Yes, when it is crumbly like that it is usually because of being lye heavy or not being properly incubated. 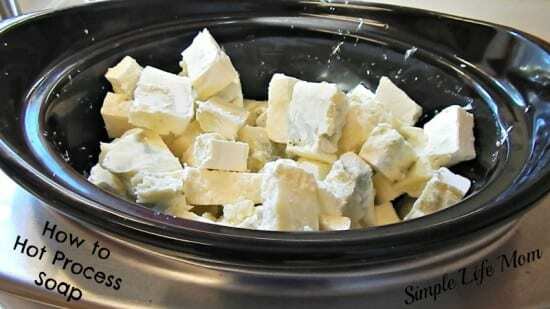 Since yours is lye heavy, put it in a crock pot or on the stove on the lowest setting. Add about 1/2-1 cup water. Let it set, checking for it to start melting occasionally and stir. When it’s all frothy like it shows in the video, scoop into the mold and flatten with a large spoon- add designs on top, whatever you want to do. It’s ready to use when it cools. Update: I cut the batch up, it was so crumbly/hard… I added a 3/4 cup of water at first, ended up adding 1/2 cup more. Sat in the crock for four hours, and it did begin to break down. Remolded it, didn’t scrap the sides, although it is different, the texture is much different… But I was able to save it to where it could be used… Thanks Kelly!!!! Yea!! It is very different, but it works. Those look fabulous! Great work! 1. First batch of cold processed soap was Lavender, you could hardly tell because I forgot to add the EO at light trace. 3. Third batch smelled great, but was awfully dark in color. I added one third of batch number 3 to batch 1 and 2, in order to get the color correct as well as the scent. I needed to add 1/2 cup of water after I chopped both of the soaps up, even though they weren’t lye heavy. Using a potato masher, the S shaped wire kind, I got in with both elbows to mush it up. I placed it back in the mold, let it cool overnight. Un-molding it, I made my molds with removable ends from wood, I noticed it was a little sticky on the inside, towards the center of the loaf. I went ahead and used my cheese slicer to make the bars anyway. I was hoping that the added water would evaporate from the center where it was most sticky. Well, I added the wee little bit of water so I could mash them up into finer pieces, and it made it mushier and easier to manage. Using the above method as per most of your instructions, I was able to save 54-4 ounce bars of soap with a retail value of over $200… I used the crock pot again to save these batches… I was a little nervous, but bold enough to try to save it… What did I have to loose? This is what I learned…. Adding a little water to a batch is okay, even if it isn’t lye heavy. I added 1/2 cup to 5 pounds of soap, let it heat up for 4 hours in the crockpot ( I use a old one that was broken, fixed it for soap making ) Use a wire S shaped masher makes smaller chunks. I never did get it to go all the way mashy like mashed potatoes, but rather chunky mashed potatoes. ( maybe I did something wrong here ) but in the end I had a good looking bar of soap that had small light purple, some purple small chunks. Generally the bar turned into a lavender color with wee little chunks in it. The softer center has hardened up now, I suspect it will get harder in time.. Thanks for sharing your experiences Jason. It helps us all get a little more knowledgeable about making soap, especially when it comes to saving those batches!! Hello ! My name is Khrista and i own and operate riversmeet Naturals. I make goats milk soaps and do not use lard or tallow. What i am wondering is can i use all vegetable shortening in place of the lard and/ or tallow in your recipes? You have so many wonderful recipes that i would like to try and i just love your site!Thank you for posting them and making them available to people like me! Thank you in advance for any help you may offer. You can make a castile soap with olive oil and coconut oil. You can also substitute responsible palm oil for the coconut oil. 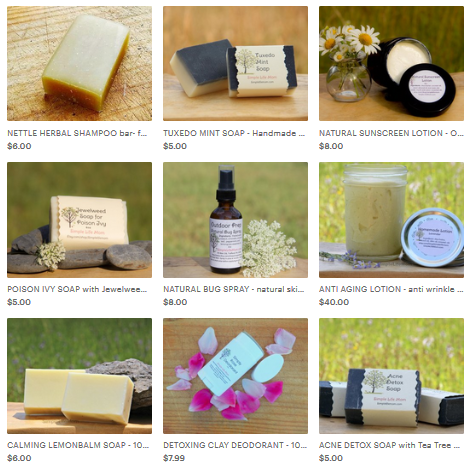 Check out the various soap recipes on my site, I have castile, palm oil, and various shampoo bars that don’t have tallow. I’ve made several different batches of soap and am doing something wrong because I can’t get the scent of the essential oils to stay. I’m guessing it has to do the temperature at the time they are added. Let me know what your thoughts are. First, when hot processing soap it’s best to add essential oils at the last second. Yes, they are mostly stream distilled and are good at moderately high temps., but they seem to last longer when added last. Secondly, essential oils are divided into notes: base, middle, top. Some scents our brain identifies quickly (top), but we quickly lose the ability to smell them (why you get used to a smell and don’t smell it any more when people who just walk in do). If you are using to notes only thirty will seem to fade quickly. Citruses can be difficult. Third, make sure you’re adding enough for the size of the batch. I add 3 oz to a 36 bar batch (9lb). That’s a lot and my bars are only lightly scented. So. I tried my very first batch today. I kept testing it. The only method I knew of was to touch it to my tongue, check for the tingle. So it seemed to continue to tingle. So I kept it processing. Then I got nervous as it seemed to get dry. So I put it in the mold. Well. I tried it out and it has a slight burning still. ? It still seems on the drier side. I’m not thrilled. Can I fix? This was supposed to be a rich coconut oil soap. Looking forward to your reply. You can put it back in your slow cooker and add a little bit of water (1/4 cup? at a time, depending on the size of your batch). I’ve had the same experience with a lye heavy batch, added more water and cooked it very very slowly, after it all changes to a different texture (mashed potatoes) I scooped it into the mold and it was great. Give it 24 hours to set then test it. Can my crockpot be used after this for food or should i use one that is specifically for soap? Use it again for food. It will be just like using dish soap in a dish before using after everything is processed. Just rinse really well.